In January last year, Nicholas Negroponte -- co-founder of the renowned MIT Media Lab -- made an ambitious announcement in Davos during the World Economic Summit: to make laptops, at only $100 each, to be distributed to needy school children across the globe. Negroponte who has set up a non-profit group - known as the One Laptop Per Child, supported by international big wigs like Google, has been jet setting across the world to distribute the wonder machine in countries ranging from China, Brazil, Thailand, South Africa as well as India. The chief of MIT Lab is not new to India - he had earlier collaborated with the Indian government to set up the Media Lab Asia, a research lab liberally funded by the government. However, the project came under severe attack for not delivering the results, forcing Negroponte and MIT to pull out. You had announced about the $100 laptop in Davos this year. Where does the program stand currently, when are you commercialising it, and how have you managed to cut costs so dramatically? We are not commercialising the $100 Laptop. That is one reason the price will be so low. We will have no sales, marketing or distribution costs. Typically, that accounts for 60 per cent of the cost of a laptop. The remainder can be divided in two more or less equal parts, the display and everything else. In the case of the display, we have reduced the price to about $40. It is a dual-mode display, that is both rear-lit, colour (640x480) and front-lit B&W at 3X that resolution. The latter allows it to be readable in sunlight - which is very important. We lower the cost of everything else by running the laptop on Linux. It is by no means a network computer or dumb terminal. Fat operating systems spend most of their energy supporting their own fat. Our machine will be instant on and feel like it is running much faster than your current laptop. It does not have a disk, but flash memory. Each machine has 500 MB of flash, which can be shared with wireless broadband, so kids in a classroom can easily have 10 GB among them. What is the kind of investment that MIT Labs has put in this project? MIT does not invest in projects. It has been part of funded research on "learning". The ideas go back to 1982, when we were working with Apple in rural Senegal. Recently, we spun off a non-profit Association, called One Laptop per Child. It sits across the street from the MIT Media Lab and has $24 mn of funding to bring the prototype, its software, and education plus rollout plans to launch. Who are the main supporters of the project? Who will manufacture the product? 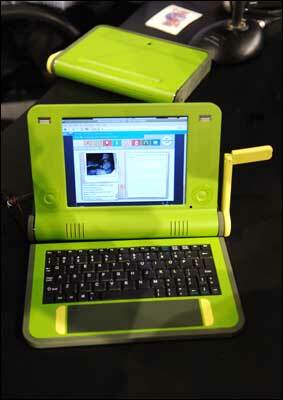 The nine companies supporting OLPC are: Google, Quanta, AMD, 3M, RedHat, Nortel, NewsCorp, Brightstar and Marvell. The support we get differs from player to player. Clearly, Quanta plays a significant role and will manufacture the laptop. 3M is helping with the display materials and backlight. Marvell is designing a mesh network chip, and so on. So will the PC have any hard disk? What kind of storage space do we get in the laptop? It has three USB (Universal Serial Bus) plugs. There is a $100 server for schools. We have people making a $10 DVD and a $20 hard drive. But, as I said above, FLASH plus shared FLASH is probably better. Also, remember that each laptop comes with an Internet connection. How is the response for the project from India? Is there a key market for such a laptop? Have you had discussions with the Indian government and looking at having trial runs here? Again, we are a non-profit venture hence do not think in terms of "markets". We think in terms of children and working as an NGO and humanitarian effort with the ministry of education. Of the seven countries we hope to have in the launch, I am the one who lags most with regards to my own work with India. The trial run would be one million units in 2007. We are not doing smaller or larger ones. Obviously these phase in, but not via small pilot projects. Have you had discussions with Indian PC companies for commercialisation of the product in India and making it a production base for such a product? Not yet. But I certainly will. The idea will be to make it commercially available through a white-box scheme, for local companies to bring to commercial markets inside and outside India. Your competitors like Bill Gates argue that a PC's cost primarily comprises network connectivity, application and software. This means that even if a hard disk is not included, it does not make any significant reduction in the PC's cost. Surely, Gates has not been supportive of the project. Kindly comment. It has something better than a disk, so I won't waste my time on the argument. Critics have just not understood or cared to look. Connectivity is very important and a real issue. Our laptop is a node on a mesh network. In this fashion 200-1000 kids can share a backbone. The one-million machine pilot project includes connectivity. Our interest is in the most remote and rural places. Consider a commercial satellite connection of 2MB download and 0.5MB upload speeds. That can cost $300 per month in the commercial market. But even that, divided between 200-400 kids, is not so bad, Keep in mind that they have broadband among themselves, peer-to-peer, and shared hard disks and DVD. India faces serious power problems. And laptops also need power. How do you propose to resolve the issue? Our laptops will run on human power. It will come with at least two means of charging: with your arms and your feet (one each, as a minimum). The satellite connection would need a generator, but we would provide that too. Human power is not dependent on the number of hours, but the ratio of human movement to subsequent run time. I mean that, simply in the worst case, one minute of cranking means 10 minutes of operation. If you use your legs, like a bicycle pump, it skyrockets, perhaps as much as 25 minutes. Please note that the laptop has many modes, one of which is eBook mode, which uses the least power, but where we need human power the most. In situations where you are running the processor and backlit display full blast - in what we call DVD mode - the ratios are much worse and electric power or fully-charged batteries are a better approach. We could also do gang charging at school - the idea being that each laptop can have a second battery ($4-6). In this case, if there's no electricity, there would be a selection of devices, like playground equipment, where kids can charge them during recess or even animals can be used. Solar and wind are also options, of course. We have found that making a laptop for $100 is easier than making one that runs on 1 watt. Your laptop runs at 30-40 watts, for example.